Pour ricotta in a sieve and let it drain for 1 hour in the refrigerator. In a bowl mix Ricotta with lemon zest, dill dip mix, and lightly season with salt and pepper. 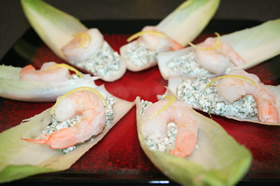 Evenly distribute the cheese mixture onto the endive petals. Top with shrimp and sprinkle with cracked pepper.